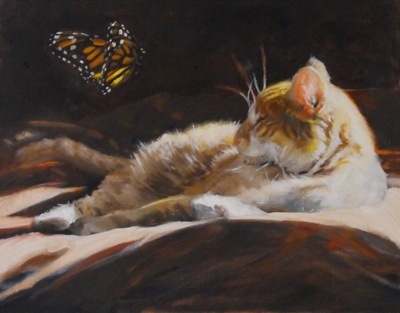 Just found out two of my paintings won Meritorious awards in the 2018 Richeson 75 Animal, Birds and Wildlife International competition. Animals both, wild and domestic have always been fascinating to me. To express my intrigue I paint, draw and sculpt these creatures hoping to portray their strength, beauty and freedom. Part of my process is to observe, photograph, draw, and research the specific creature I am about to recreate. I become intimately involved. Sometimes I am able to identify each animal I paint by their given name, like Conga, the leopard—a resident of Lions, Tigers and Bears, a wildlife sanctuary in Alpine, CA. I like painting animals that fill the canvas. This allows myself and others to get up close and personal. I don't feel the necessity to paint every detail; rather, I concentrate on expressing the animals compelling presence, at times using only pallet knife, by working in strong contrasts of light and dark, using vivid colors.